Can you believe it’s already April!?! I’m excited for Spring, but I wish time would slow down just a bit. I am loving the Visiting Teaching messages each month…how about you? And this month’s is not different. For this month’s message I decided to create a bookmark. I really like how it turned out. I loved the story of the woman comparing herself to a 20 dollar bill. 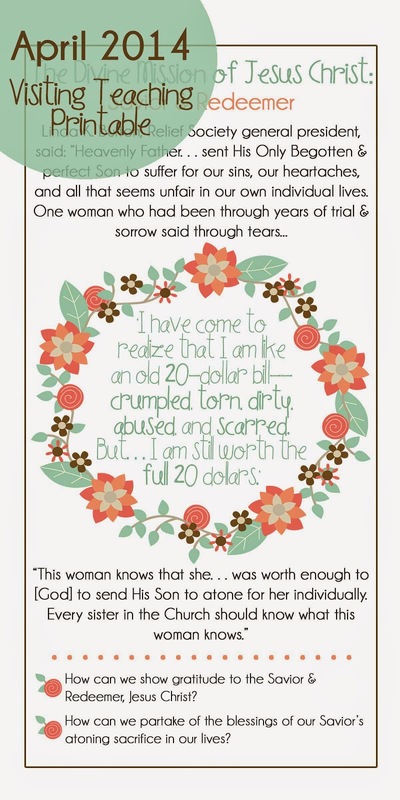 What a great reminder for us as women to remember…we are still worththe full 20! No matter how bad our day went, how beat up, broken, dirty or torn we are; our Heavenly Father still loves us. Our Savior, Jesus Christ, still died for us…for YOU. Click HERE to print out my April VT Message. This is a cute hand out to go with the message for my visiting teaching.